Weather looks good...nice and cool. Track temp should make the tires last longer. Go Seb, Kimi. Forza Ferrari! Alonso should be a politician after he hangs up his helmet. Today Ferrari is going to win. I'm sure of it. If we don't have mechanical and/or technical issues, no bad strategy calls and if no other driver hits our drivers we will win. In a normal race even with a SC in any conditions. Dry, changing weather or rain from start to finish. 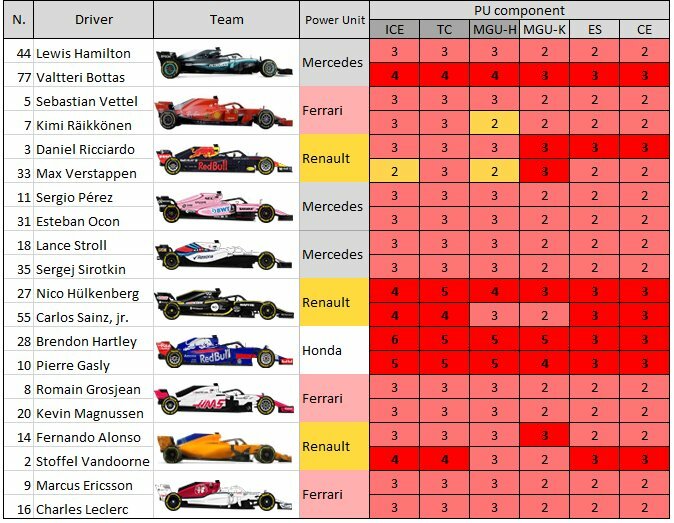 Ferrari have the upper hand on engine power. Why am I making this prediction? Because it's enough of this doom and gloom. If you believe it will happen. And I'm not going to write "told you so" after the race. Maybe you should include "and if other drivers/teams are not faster" to the list as well. Possible realistic scenario - Ferrari 1-2. Vettel 1st and Kimi 2nd. The 24point lead will be down to 14 which is doable as I thnk we have the car to achieve 1-2 depending on how we play the first few laps. Ideal situation, Ferrari 1-2, with Hamiltons spec 3 engine giving up due to rushing the dyno testing. The drivers have room for small mistakes. The car/package will at least level that out. I'm sure of it. Seb has higher top speed then Lewis, even if we cant get him on lap 1. We need to keep within the 1sec when DRS comes into play. Seb can afford to be patient. Having the faster car is a huge advantage. And he has that. Hoping for a win.... and both cars on the podium. Following another car that too fastest car is very difficult this year. We shall see how it unfolds. But Vet’s best chance is lap1 only. Other than that we need to have superior race pace to beat ham on strategy. Best result for me would be a Ferrari 1-2 and a Lewis dnf. But I don't have the luck Lewis does, so.. not going to happen. Not much worse than last year and he was awfully close. I'm afraid of those cars behind. Random question, do the drivers have to use a clutch/pedal other than on the start? Not for gear changes, nope.